On this weeks show we take a spooky look at themed marketing – does it work? What is themed marketing? 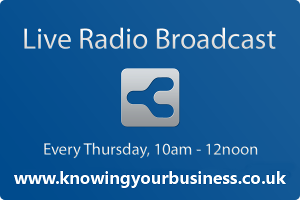 The Knowing Your Business Show ask Beverley Bates, Dan Toombs, Justin Firth and Claire Boyles to find out. Beverley Bates gives her themed marketing insights within the hair and beauty industry. Dan Toombs who works in the promotional merchandise industry offers his thoughts. Dan, also known as the Curry Guy was born and raised in California. Now running a successful business in North Yorkshire. Established in 1997, CompuGift Limited is the leading supplier of promotional pens and promotional stress balls in the UK. A chartered marketer and former director of Add Design, Justin is now pursuing his interest in the marketing of new technology and green thinking. Claire Boyles the online marketing expert gives us her thoughts. Ian Gentles – the Digital Marketing Manager of Banburyshire Info and Knowing Your Business.